As we discuss politics with each other, it is important to realize that there is more complexity possible than just left and right. If we add just one more dimension, then a much more nuanced picture to guide discussions of how we should construct society emerges (see figure below). As an example of its usefulness, one can immediately reconcile the fact that authoritarian communism and fascism appear similar in some obvious respects (much less personal freedom) and yet are opposite in others (position is ideally obtained by selfishly winning, for fascists, or by participating selflessly for communists). One can also notice what libertarians have noticed for a long time: that they often find common ground with progressives and socialists on the issue of civil liberties. Then, we can start a discussion by suggesting that each part of this space has advantages and disadvantages. If we average views over all of the people in our country, we could plot a single point in this space to represent that average. Then, we can discuss where other countries and time periods for any country would be plotted. We are also reminded that this average point can move quickly. Do you wish society prioritized order and a productive place for all citizens above individuality? Do you wish society was pure and efficient and needs to weed-out unsuccessful people? Do you wish there was complete personal freedom as long as property was respected by all? Do you wish for complete personal freedom as long as power was equal for all? Within these extremes, most of us find some middle ground. Most of us have compromise positions within a variety of extremes, not just two in the standard left versus right polarity. It is these places of partial commonalities that political compromises will be reached. In the interest of full disclosure, I am a liberal progressive. I believe in large amounts of civil liberties and help for the poor. I am willing to sacrifice some efficiency and order for these larger goals. Absolute equality is too lofty a goal, but we should strive for it. Property should be respected, but to a point. People and their well being and rights must come first for me. I am increasingly to the left of the country as a whole, but my views have not changed much. Instead, the country’s leadership has been moving to the right. It can be argued that the US Constitution distributes power downward. Where government power exists, it is splintered for checks and balances. There is freedom to acquire wealth, but the essential problem is that wealth and power are correlated – it’s a cold hard fact. When wealth concentrates, so does power. That concentration weakens the political equality between us that is provided by the Constitution. Slavery is the obvious example of how property rights and personal rights have clashed, and one can easily make a strong argument that the KKK was a fascist movement. The more I see the flag and the cross projected simultaneously with discussions of the primacy of property rights, and the lack of concern for helping the poor and the weak, the more worried I become. The more I see that we have the most guns per capita, the most people in the criminal justice system, one of the highest concentrations of wealth, more talk about ignoring science in favor of dogma, etc., the more worried I become. 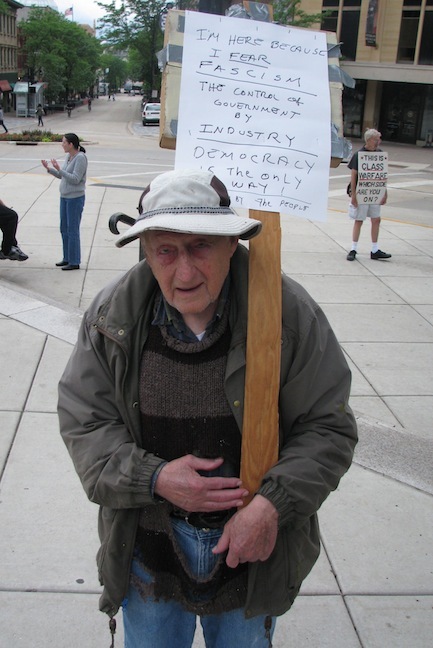 I see huge attacks on unions and on public systems. I see court decisions that claim corporations are people and that money is speech: things that stratify people further in an already hyper stratified system. I see internal surveillance increasing. I see education being de-funded and voting more restricted and less transparent. Information is more centralized by a few large corporations. Corporations were designed to insulate personal wealth from business failure and are a product of government. Now, these entities are put ahead of government in a strange twist of logic. Beware: this country has a huge capacity to become very fascist. All that is missing, heaven forbid, is a very large economic and social disruption, a crisis that requires that emergency measures be put in place. Before this would ever happen, it is up to every one of us to reach across to other people. Progressives absolutely need to be proud of their place on the political space pictured above and be willing to engage the right wing in any discussion. Do not let anyone propagandize you that we are too far to the left. What country are we to the left of? The USA should obviously move leftward now, back to the middle where it was and where it belongs. I would put quotes around the term ‘communism’ as it is used in this article, as it is nowhere near what Karl Marx envisioned. What Marx envisioned was much closer (but not exactly) to the Anarcho-Communist or Anarcho-Synicalist position in the lower left of the graph. 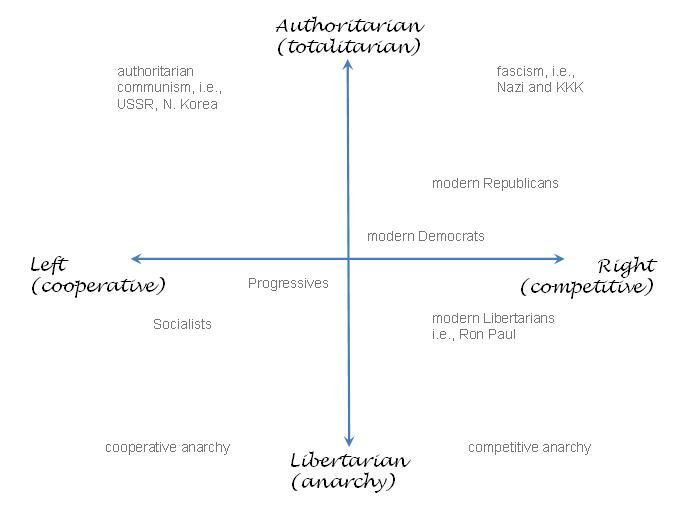 Also I would put both modern Republicans, AND modern Democrats much closer to the upper right hand corner, and place them closer together in general. Where you have them is where they may have been twenty years ago.